Being that I have dedicated much of my life to service, people are often curious about when I got started and who got me involved. Well, the first service project I remember taking part in was a walk to raise money to fight hunger when I was around 8 years old. Although, it’s very likely there were some other service activities before that one. As for who got me involved, that credit goes to my parents. It was them who I walked side-by-side with in that fight against hunger all those years ago and who supported me in countless service efforts throughout my youth. Service has always been part of my parents, including my step-parents, lives and I feel blessed for having learned the importance of giving back at an early age. I remember when I was growing up my mom often told a story about volunteering to help mentally and physically challenged kids. Every time she would tell the story, her eyes would feel with tears of joy for the imprint those kids left on her heart. I believe it was that unforgettable experience that led her to living a life involving service, which continues today. In fact, I just learned she will soon be honored for her volunteer work at The Shelter for Abused Women & Children in Naples, FL. I could not be more proud. It is my great pleasure to share with you the story my mother first shared with me decades ago. During my freshman and sophomore years in high school, I volunteered on Saturdays to work with mentally and physically handicapped children. As volunteers, our tasks were to get them to play games, do arts and crafts, sing, etc. While these are things that all kids do, most of these children suffered extreme handicaps and were in wheelchairs, used walkers, had trouble holding a fork, spoon or crayon. While it was a challenge, it was definitely one of the most rewarding things I’ve ever done. I learned a great deal about life, people, struggle, myself and pride by working with these kids. But mostly I learned about determination and love. I learned that unfortunately, for many of them one of their biggest handicaps was their own loving family. You see many of these children were born the way they were and knew nothing different so strived every day to just do better than the day before. They wanted to laugh and play to whatever extent they could, just like any other child. While they didn’t necessarily know they were handicapped, or different, their families did and many struggled with their child’s differences and sometimes even added to their handicap. It was great fun to watch and be part of them overcoming obstacles in their art work, which could be as minor as getting color on a paper to standing up from a wheel chair because “Simon Said” (these memories still make me smile). Unfortunately, at the end of my sophomore summer I had to get a paying job, which meant I had to leave this group of children I was deeply bonded to and from whom I had learned so much. My last Saturday of volunteering was a tough one, as I didn’t want to say goodbye to these amazing people who had become such a part of me. But, realistically I had little choice. On that final day, I was delightfully surprised when I was presented with a gift. 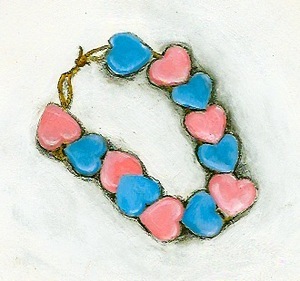 With the help of a couple other volunteers, my kids made me a beautiful bracelet by stringing together pink and blue hearts on a double elastic. I know the love and determination it took for them to make this wonderful gift and I will always remember the most beautiful smiles of love and pride on their faces when they presented it to me. Little did they know the bigger gift was just having the privilege of knowing them and working with them. I am now 63 years old and even though my husband is a jeweler, he and our children know that this bracelet is, and will always remain, my favorite. I walked away from this experience knowing I had received far more than I ever gave and that I am a better person because of it. This story and others like it will appear in my upcoming book, Soul Serving: How Helping Others Will Change Your Life, which is currently being funded through Kickstarter.